This example illustrates our Portfolio Maximizer Practices. Portfolio Maximizer shows us how to use our gains (money we took from the market), to invest in more lots. This software guides us to reinvest our profits logically and methodically. In the above example, you never added to your initial investment. The advantage of Portfolio Maximizer is clear. A $1,250.00 compounding factor was applied in our examples. Your emini trading account can be thought of as a business. All business owners know that in order to grow, they must reinvest some of their profits back into the business. Your emini trading account is no different. 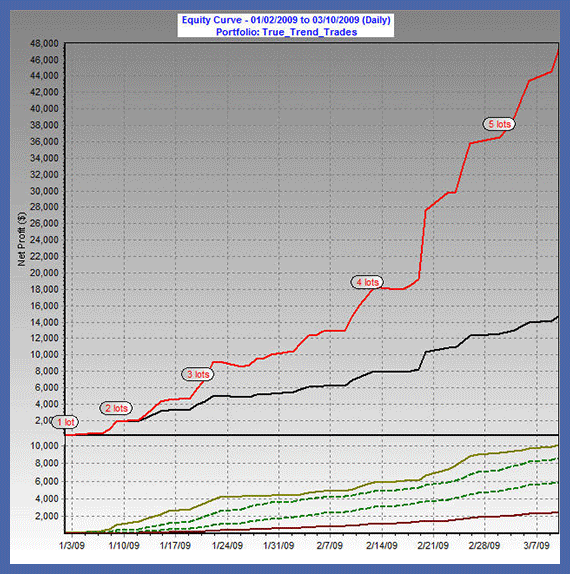 With emini trading accounts, compounding is often misunderstood, and is usually not used correctly. Given the power of this relatively simple concept, surprisingly little information on compounding can be found throughout industry publications. With this lack of quality information, it is no wonder that people hold onto what the market gives them, and hesitate to reinvest their gains. 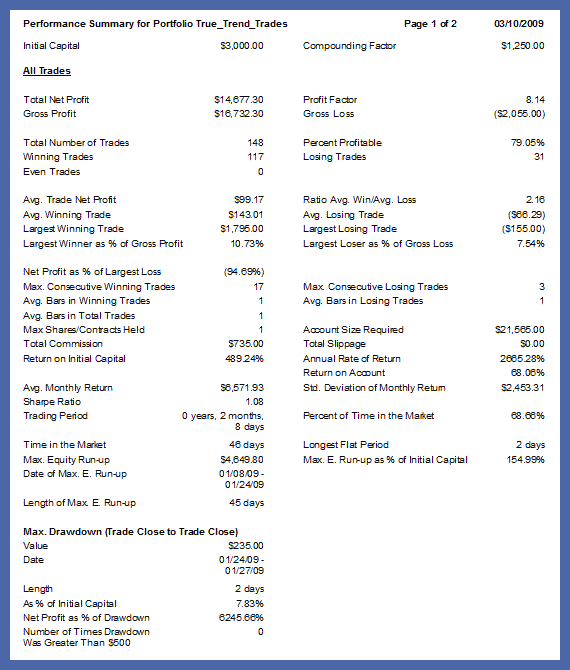 Our emini trading school has discovered that, when applied conservatively and methodically, compounding your returns can play an important role in long-term success. With Portfolio Maximizer compounding software, you can begin with one contract. The compounding software tells you when it is safe to add more contracts during winning cycles, and when you should reduce your market exposure due to periods of drawdown. As a percentage of your total account, your profits should increase while controlling drawdowns. Your average winning trade will increase as the amount of contracts traded increases. Portfolio Maximizer automatically evaluates the Traders trades and market conditions to determine when to stop trading an entry to help reduce and possibly avoid extended drawdowns. Portfolio Maximizer will then determine when to restart trading. The markets along with Portfolio Maximizer will determine how long this period will be. Imagine not trading during a period that the markets and your system are not in agreement. Portfolio Maximizer will identify when you may be going into a drawdown that is in a downtrend. All aspects of trading involve emotions, and we know it can be stressful to increase the size of your investment. Our emini trading course offers the tools you need to overcome the emotional roadblocks you will face while emini trading . When applied to an accurate, diversified trading program, compounding can be efficient, powerful and safe. The better the trading program, the more our compounding software will help. Emini trading school trading software offers diversified emini software signals that change with market behavior. When our dynamic E-mini trading style is applied to our compounding software, the result is a sound trading plan and a smooth equity curve, focused on long-term steady success during all types of market behavior. We look forward to discussing our Portfolio Maximizer with you. We invite you to ask questions in our Live Trading Room! 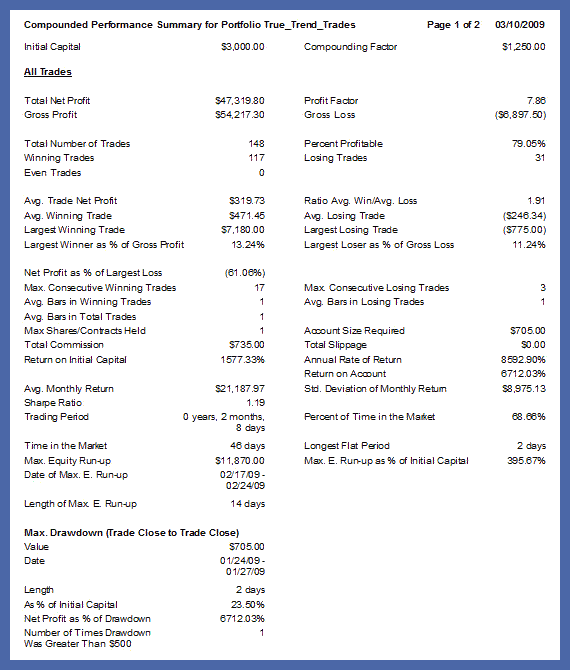 Below is the same Performance Summary as above, but not compounded. There is nothing more powerful in the universe than compounding. Don’t be a trader who does not compound when returns when it is appropriate.